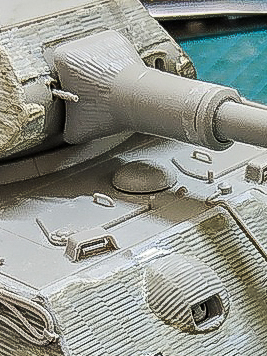 Hot on the wheels of their Tiger I with Zimmerit comes the HobbyBoss King Tiger in Porsche turrent (yes the Tiger I is Trumpeter’s but they are the same company now, not sure what logic they use to decide which label gets to release a particular kit…). 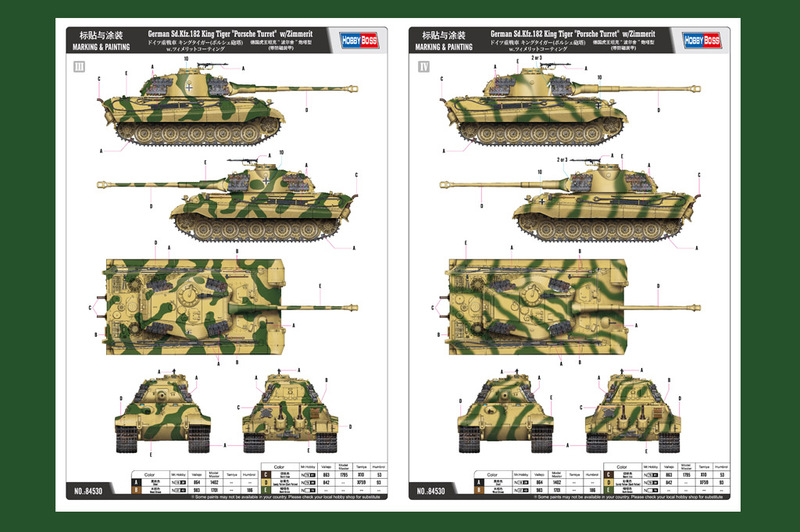 There is some sort of market acquisition thing going on between the different manufacturers, with Meng releasing their very popular and low cost King Tiger in 2017, and HobbyBoss is targeting the same market with even lower priced kits. In their original MSRP in China this kit is about 20% cheaper. 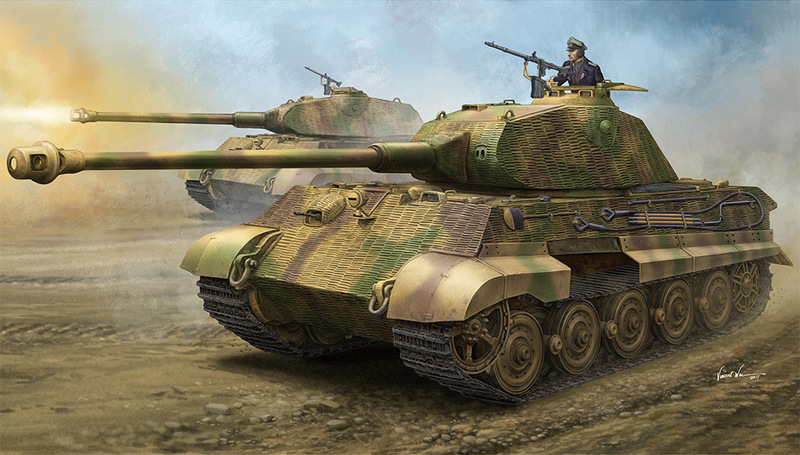 Yes the Meng kit is Henschel turrent and HobbyBoss Porsche, but Meng has now released their Porsche variant and Hobbyboss releasing Henschel with the same MSRP. 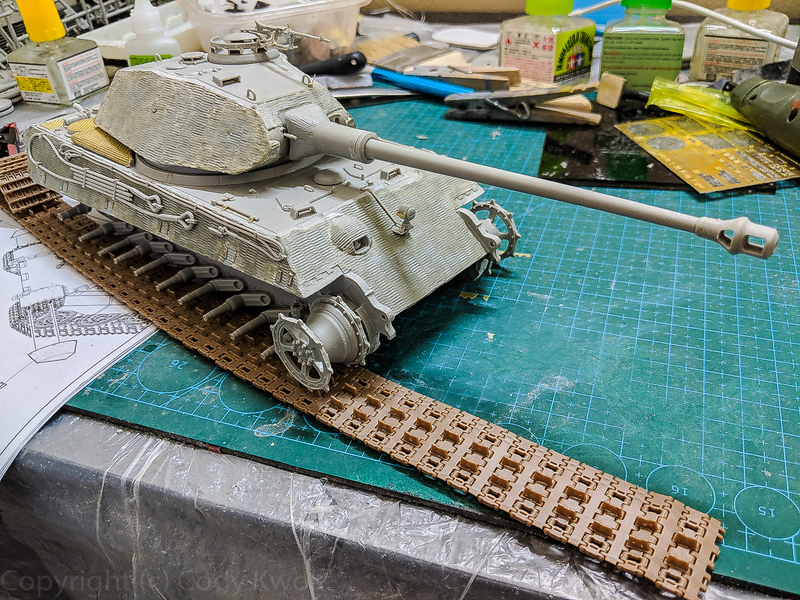 Because I have also built the Meng kit, I’ll make some comparisons between the kits in terms of the build, not about accuracy (which I cannot make any claims of). There are 4 suggested paint schemes with no mention of where they were. There are two variants of turrent you can choose from but the kit didn’t mention which paint scheme goes with which turrent. 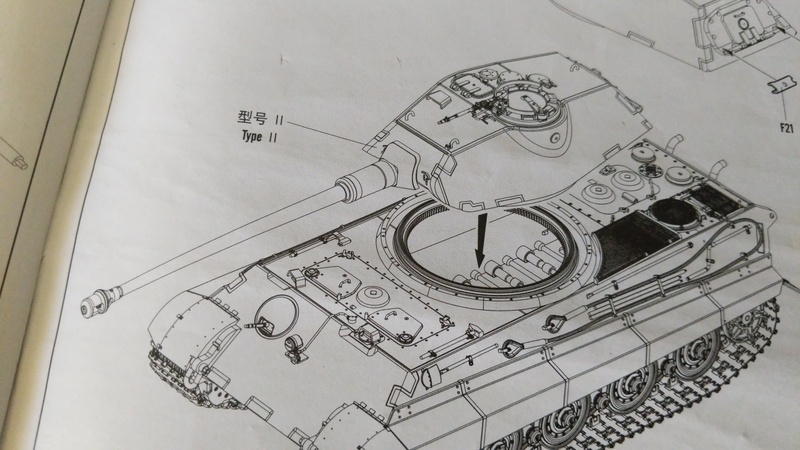 This is where I appreciate how much Meng did their research in variants and clear built options. 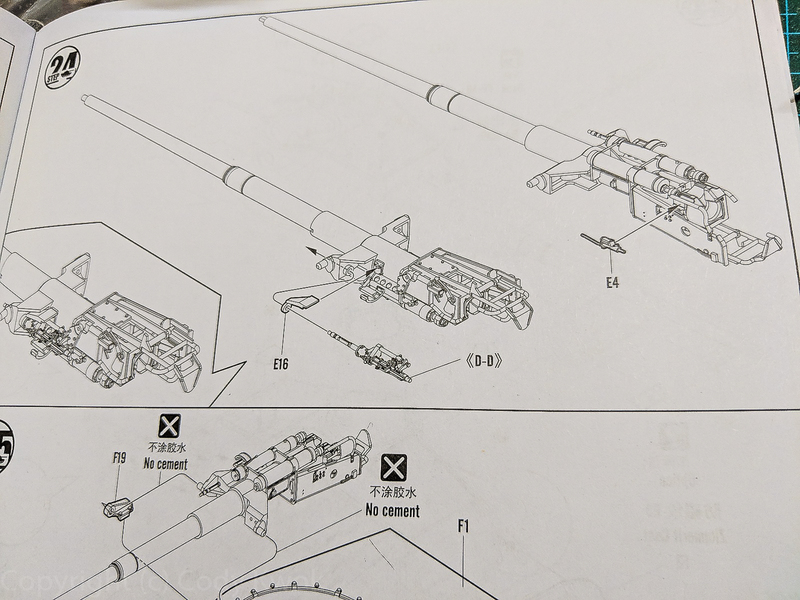 This KT is all new tooling, with some very nice features you have to pay extra in the Meng kit, including suspension, workable tracks and optional zimmerit sheets. 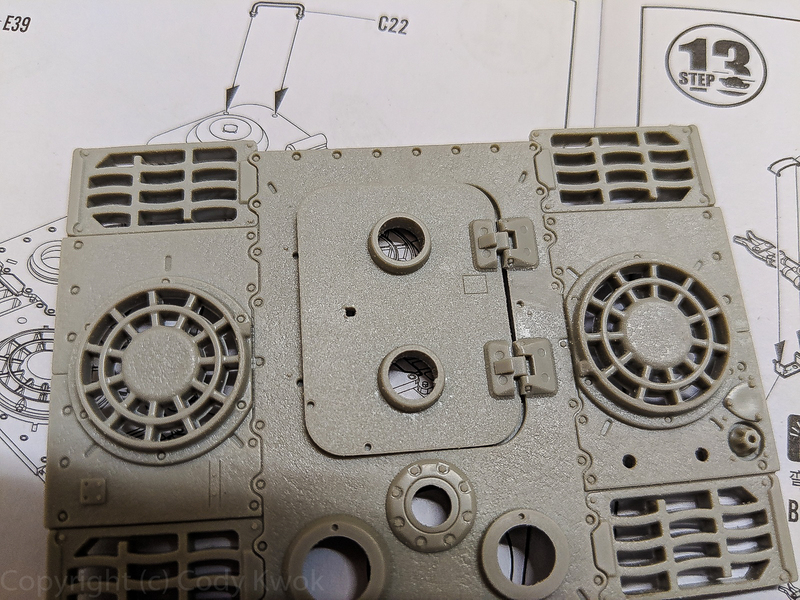 Hobbyboss/Trumpeter has their unique solution of using thin styrene zimmerit sheets (as opposed to the zimmerit decals for Meng). Most of the Porsche KT has zimmerit so they are welcomed additions. The styrene sheet is a bit thick compared with ATAK resin sheets. Curiously the both sides has patterns with the “right” one the side with deeper grooves. The issue as many reviewers pointed out in their Tiger I kit is the uniformity of the pattern. The other problem is they’re also too deep and look out of scale, so you want to either sand them down or use some putty to fill them a bit. 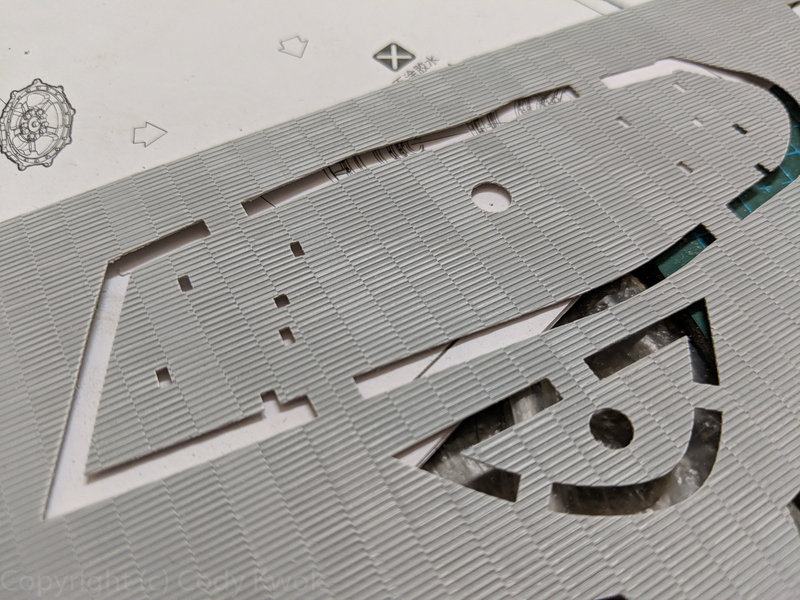 There are extra pieces with zimmerit on the turrent and machine gun port where it is difficult to layer a sheet. On these pieces the zimmerit are really well done. 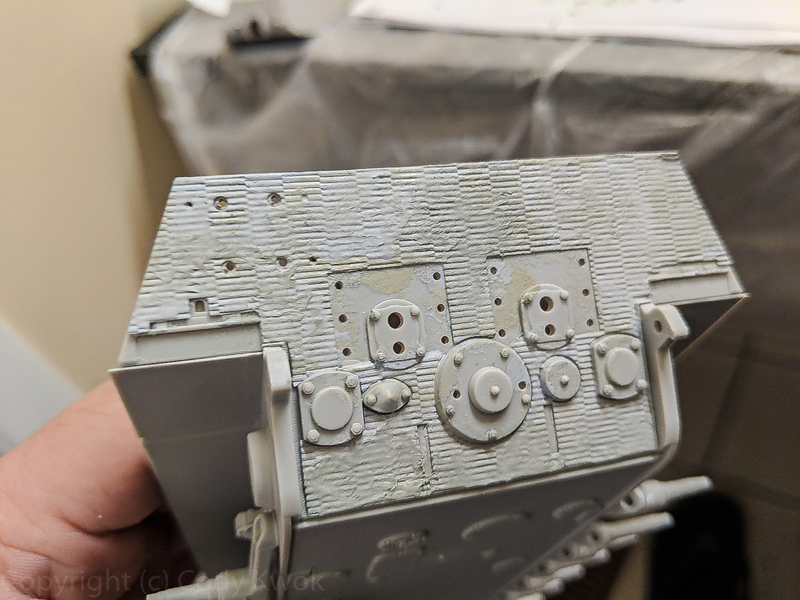 Initially I didn’t like the thickness of the styrene and used an orbital sander to thin it, but it seems to make little difference so I lived with it on the turrent. To break uniformity I used Mr. dissolved putty to put a layer on the zimmerit and applied random brush strokes. It looks more convincing afterwards. But this is actually quite a bit of work until I got the hang of it. 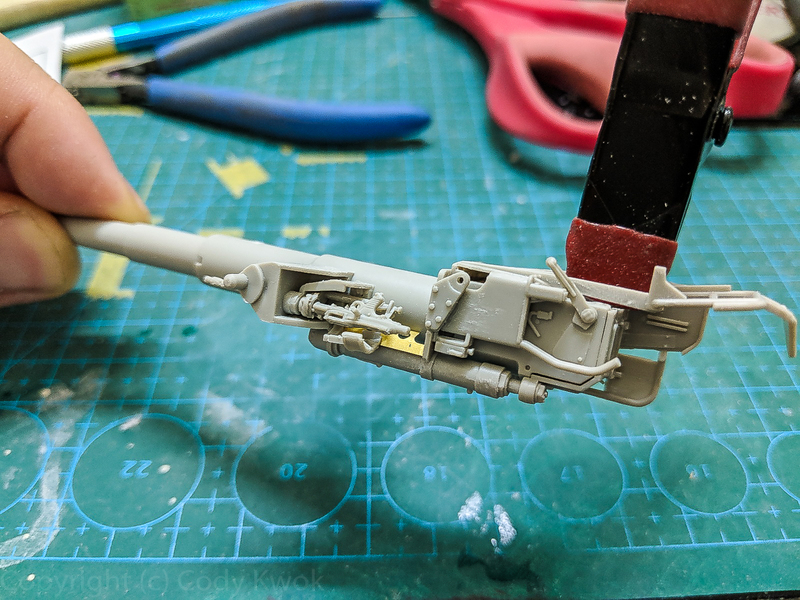 I’m getting myself some zimmerit tools to do it by hand next time, which gives better results and not that much slower than messing with the kit version. I like the inclusion of workable tracks and these guys are attached solidly together with glued-on locking mechanisms. You can see on the upper right corner how the tracks go on together. Using a piece of masking tape I laid the tracks flat and got K2 and K3 next to each other, then using quick setting glue I placed the guide horns on K2 which acts as the locks. Metal tracks are easier but this isn’t bad at all. Next comes the hull, the torsion bars lock into the opposite sides and worked quite nicely. The hull went together quite nicely. HobbyBoss chose to use PE for tool clips, which was a bit of work but the end result is nicer. 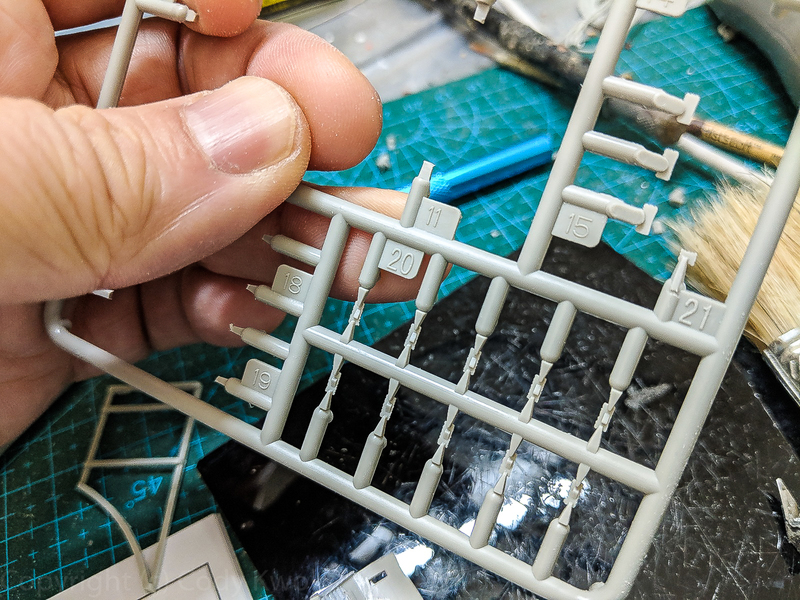 Meng and Tamiya all has molded clips and they are all slightly too thick. The machine gun has a complete assembly but will be invisible. Unfortunately the machine gun itself is molded in such a way that guarantees you have to drill out the nozzle yourself. This is also where I ran into some fit problems. The engine bay door just simply wouldn’t fit. I forced the piece in to the opening and you can see the gap. It seems the shape of the hinge was interfering with the groove, so I sanded it down. I don’t know whether it is more accurate, but the PE meshes in the kit have more details than the usual grille in other kits. It looks like there is a bit of molded weaving which looks quite nice. 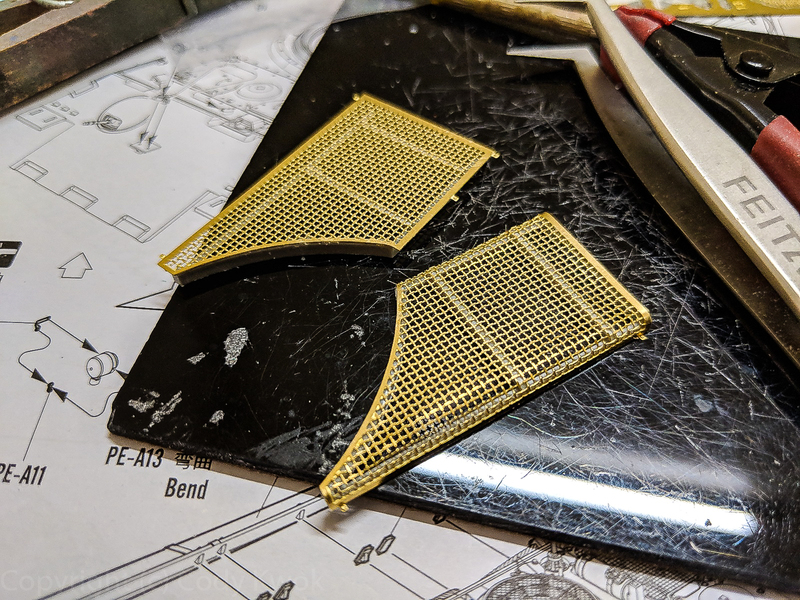 The curved PE grilles of KTs are a bit tricky to work with. This is where I appreciate the rig that Meng provided to snap the PE pieces into shape, and Dragon chose to pre-curve them in some KTs. Here I first superglued the pieces on the the frame, and then slowly got the edges to conform. HobbyBoss chose to do the following for side skirts, where you have to glue on extra pieces if you choose to have no side skirts. I suppose most people want the side skirt and could snap them right onto the hull. I was doing a turrent 121 version which has no side skirts, so I had to glue the tiny B20 and B15 pieces. Meng have these pieces on the hull already, and the side skirts are molded to fit on top of them. This isn’t so bad except the B20 pieces were molded with side AND under-gates. Why would you have undergates, TWO OF THEM, in such a small piece? And they are also close to the fitting tab. They’re quite tedious to clean up to say the least. This obsession with undergating has to stop. Anyway if you decide to not have side skirts, in many configurations you wouldn’t have front guards either. 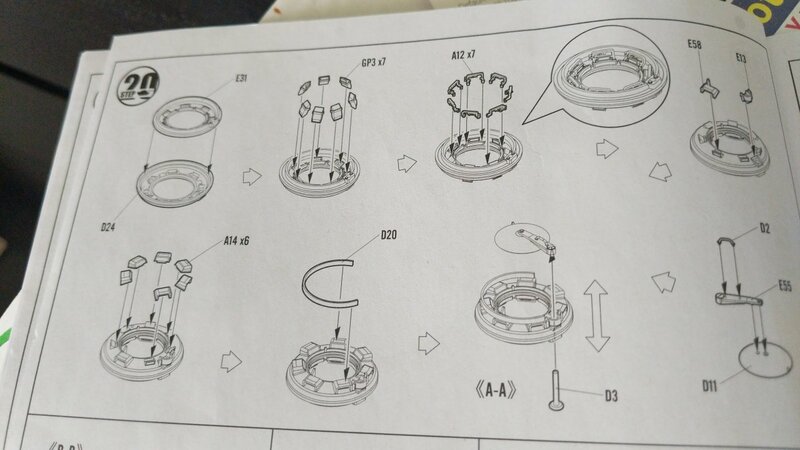 As you see in the instruction picture above, there are tabs to hold the front guards in place, so if you don’t want the latter you have to cut off the tabs as well. The top and bottom of the hull fits very well. Moving onto the turrent, another fit problem in the cupola. 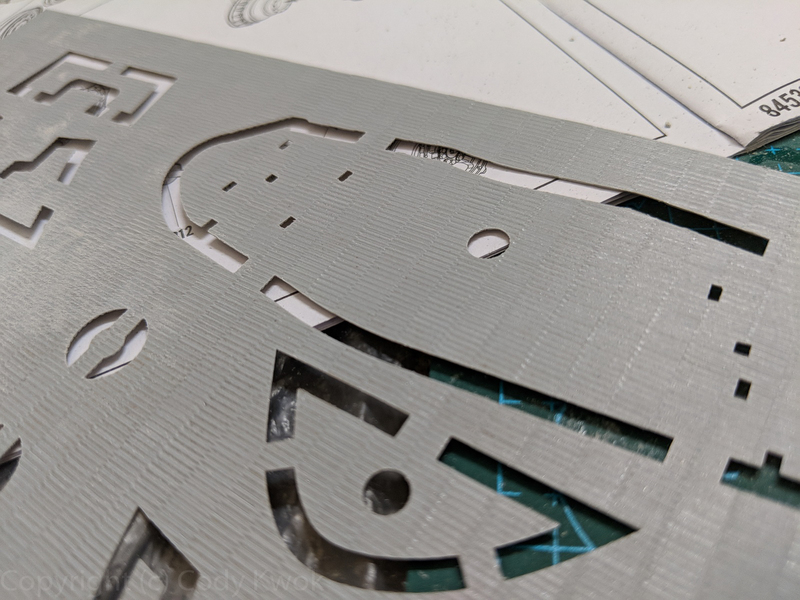 The fit for the periscopes are very tight, so you need to sand them smooth and use a lot of force to push them through. That shouldn’t have been so difficult. Other than that there are some details inside the cupola which is nice. The guard rail on top has no fitting tab so you need to position it a bit. Beginning from step 22 this is where the instructuctions were unclear what’s going on. For this kit you can make two types of turrents, I’m not sure exactly what variants they correspond to. 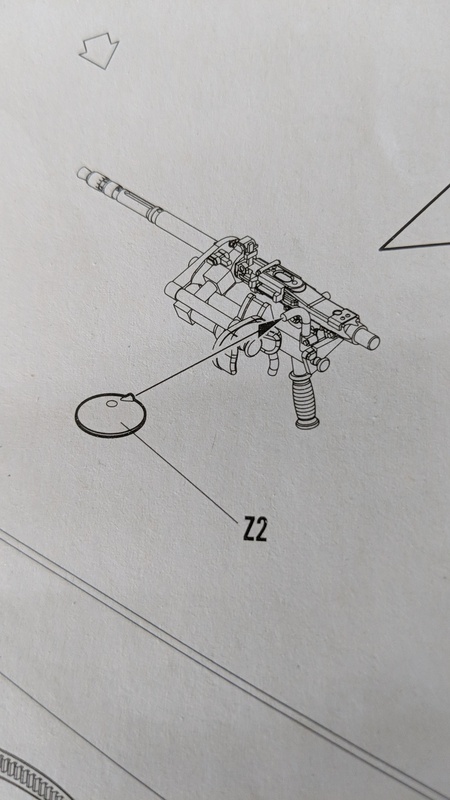 For type I it seems you’re getting a turrent with some antenna spots, a barrel that looks like what’s on regular Henschel’s, and hooks for spare tracks. If you’re like me and doing Type II, the instruction starts at step 28. It has a different barrel and no spare tracks nor antenna slots. I made the mistake of drilling the slots out in step 22, so had to fill them. The gun itself has a complete assembly, that are obviously invisible after you close out the turrent. The barrel is slide molded with easy-to-clean-up seam lines. It’s a shame really, because they even have PE pieces on it. 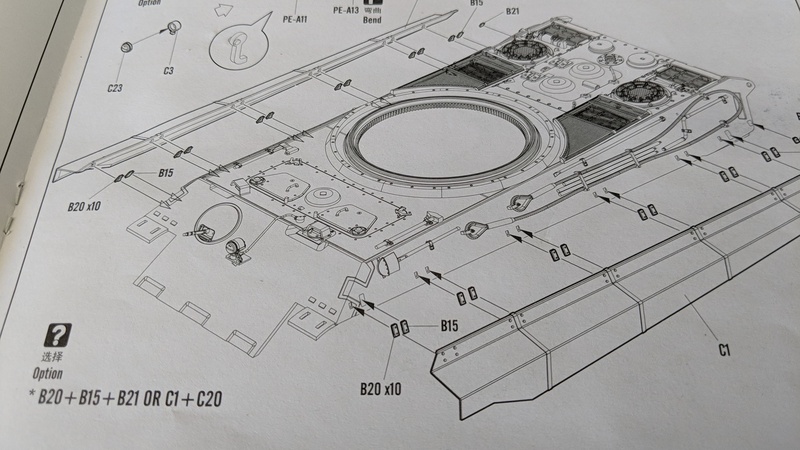 There are no other details inside the turrent to show off interior for. 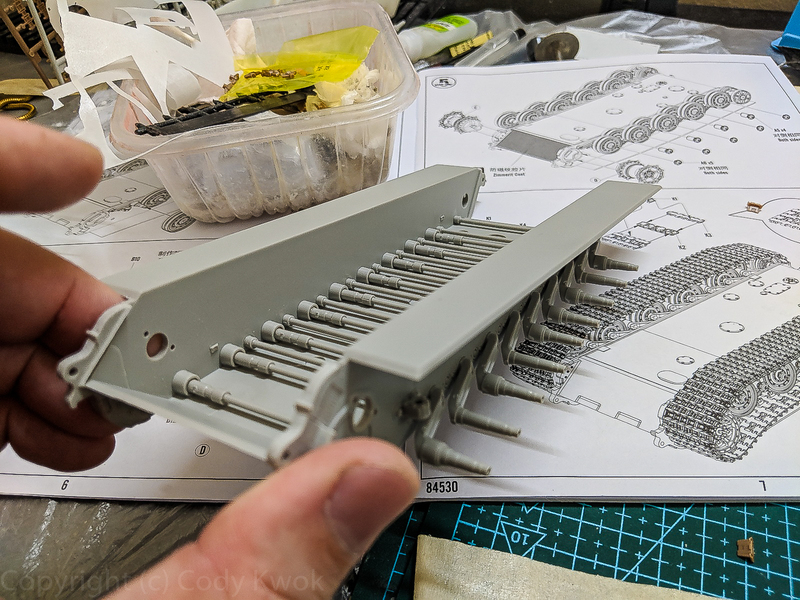 The MG has a full assembly here as well, and like the hull’s MG you have to drill out the nozzle. 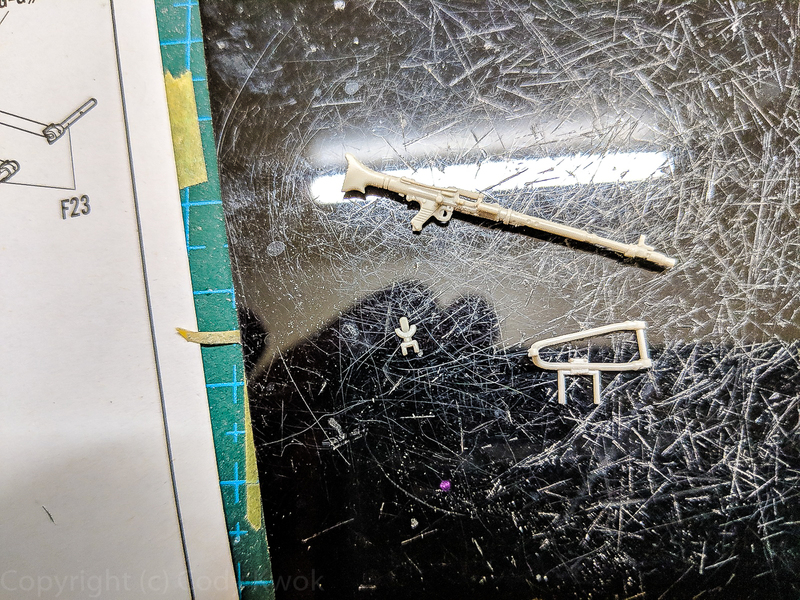 Here is the completed gun. Finally to finish off I worked on the AA MG. I don’t know whether my variant has it or not but it looks better with… But the MG frame leaves something to be desired. 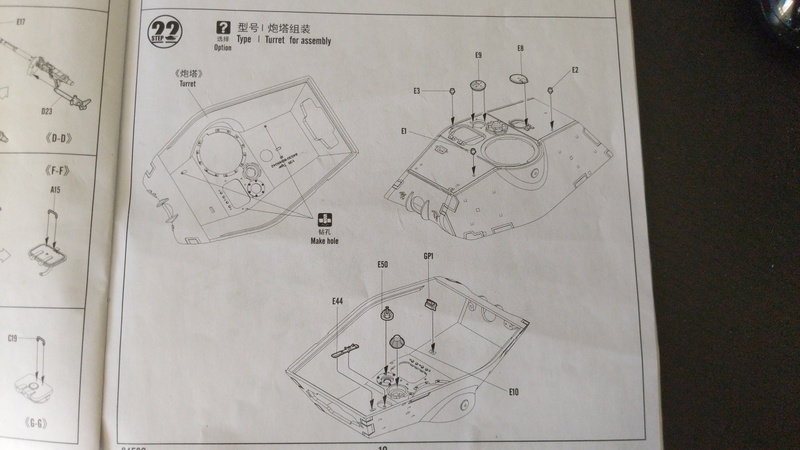 There is a U-shaped holder for the MG, but there is a huge tab in the middle of the trough you have to remove, alas. Also in Meng’s kit there is a bag for holding the MG belt, but it’s missing here. With that we’re almost done. 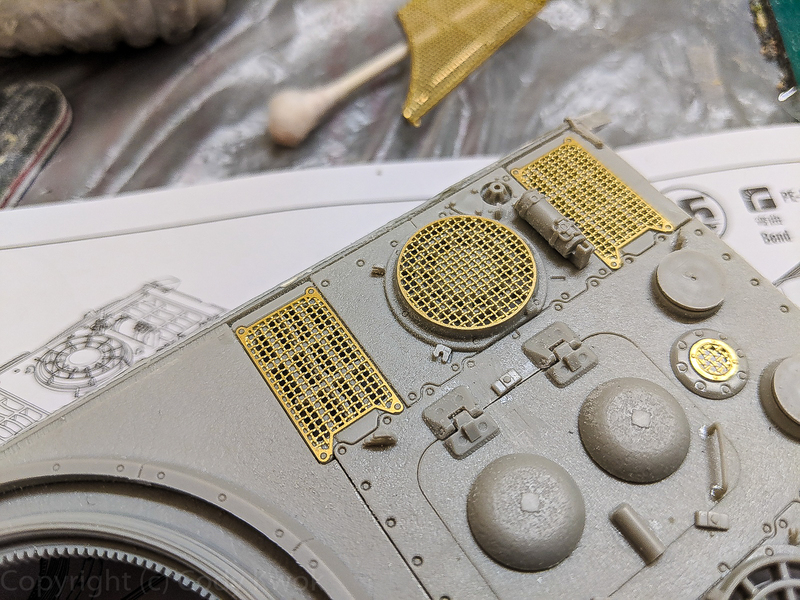 I glued the front turrent’s zimmert wrong, but in any case from all the photos I’ve seen the zimmerits are densely applied around the MG and vision ports, but the kit pattern gives you retangular openings. I guess I have to do my own zimmerit here afterall. Conclusion: Overall this is a pretty good effort from HobbyBoss and the model came out quite detailed. 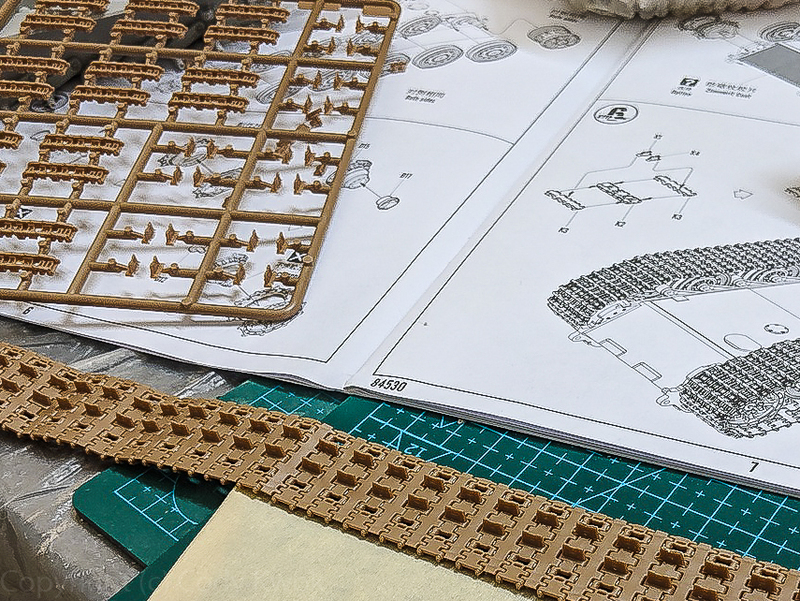 I haven’t done a Dragon KT to say how it compares, but I think it is a bit more detailed than Meng’s in several areas and is also more work to assemble accordingly. It has some fit issues that you can get over, and I do like their workable tracks and suspension. 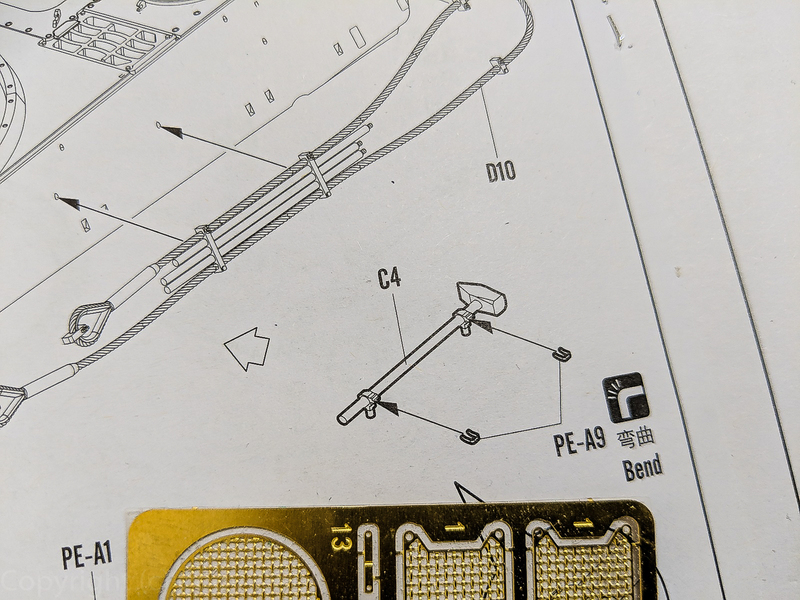 I don’t really understand why companies supply these separately except to make money; in particular Meng’s kit with the crazy single links are already tedious to assemble, but you also need to shape the track while gluing them which I find to be more difficult than letting the workable track forms its own opinion on how to conform. 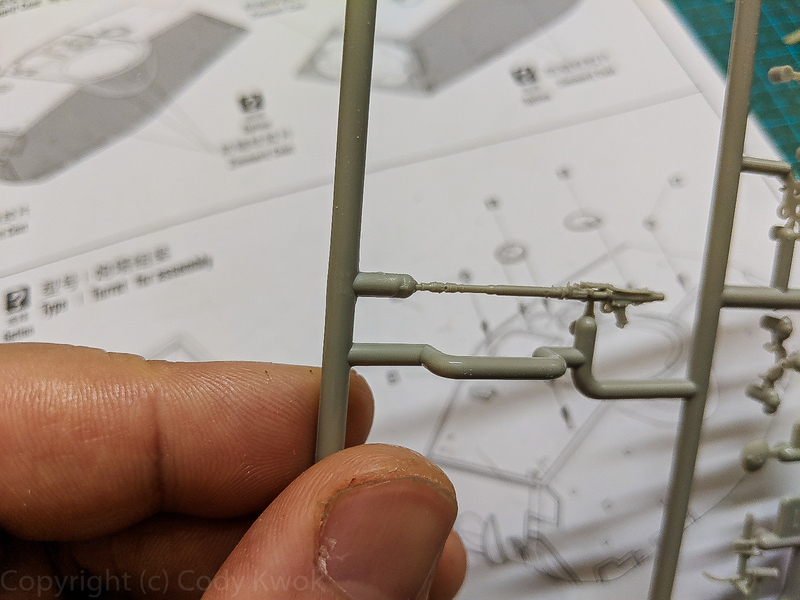 The styrene zimmerit is another weak spot and of course you can always make your own zimmerit, but the kit ones can work with some improvisions. I highly recommend this kit.